"I love breakfast casserole and was looking in the fridge for bread and breakfast meat to put in it. I pushed the pizza aside to realize I have no breakfast meats. Then it dawned on me... Can be assembled the night before and stored in the fridge until morning." Preheat oven to 350 degrees F (175 degrees C). Spray a 9x9-inch baking dish with cooking spray. Arrange pizza squares in the prepared baking dish. Mix eggs, milk, mozzarella cheese, onion, butter, garlic, oregano, and salt together in a large bowl; pour over pizza pieces. Top with Parmesan cheese and red pepper flakes. Cover dish with aluminum foil. Bake in the preheated oven for 45 minutes. Remove foil and continue baking until eggs are set and Parmesan cheese is melted, about 20 more minutes. I'll admit, I was very skeptical... Eggs, Pizza??? But decided to give it a try anyway. This was surprisingly delicious! Thanks for the recipe!!! There are just the two of us. 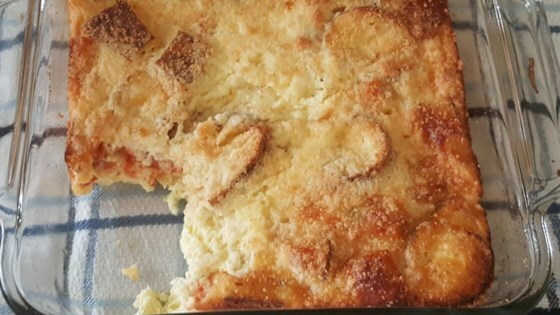 It is good, but now instead of leftover pizza, we have leftover pizza casserole ! This is a great dish created by a person who thinks outside the box. Can hardly wait to try it again.